I believe research reports that the typical Irish diet (peasant diet, no doubt) before the great potato famines consisted on average of 10 pounds of potato per day. Pre-famine, that diet apparently was sufficient. Thanks for your nuggets of data for garden planning. Saute some onions, garlic and jalapeno in some olive oil. Add some diced sweet potatoes, Irish potatoes and julienned green beans with enough canned tomato sauce and water to cover. Boil until veggies are done. Add peanut butter (about 1/2 cup for a pot of soup), cumin, salt and pepper. Stir well to mix in the peanut butter and it’s done. For the batch I made a couple days ago, I used just picked walking onions and jalapenos, 2012 elephant garlic, sweet and Irish potaotes and green beans and my last jar of 2011 tomato sauce. I didn’t grow peanuts this year so the pb, and spices were purchased. I used olive oil for this batch but have just added the finely chopped onions and such to the other veggies and boiled them without the saute step. It came out fine. My family is slowly learing to eat what I can grow in regard to calorie crops. I don’t know if that is a challenge for others but it is for me. 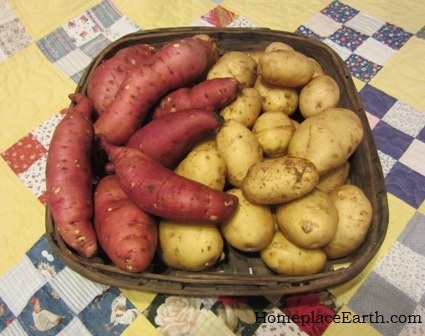 Growing white sweet potaotes (Nancy Halls, especially) has helped as they are easy to substitute for Irish potatoes. I grew some dry corn for meal this year and the first batch of cornbread was a tasty addition to a mostly homegrown chili dinner. Do you know which peppers to grow to make homemade chili powder? That would help bring our chili all the way home. Vicky, that sounds good! Our work isn’t done until we can get this food all the way to the table in a way our families will eat it. My children are grown, so the only regular fussy eater at the table is my husband–and he’s come a really long way over the years. The kids have become suporters of local/homegrown food now, rather than wondering why the food on our table is different than the manufactored food they see elsewhere. I don’t know much about hot peppers. The years I grew them, I would dry them on a string, then crush a pepper into the chili. About your cornmeal–you could put that cornbead batter into a cornstick pan, which is interesting, or make cornmeal mush. Cooked with milk it was called Hasty Pudding in the Little House on the Prairie books. Sweet potatoes don’t need to pretend they are anything else. Cut them into “fries” and give them a coat of olive oil. Bake the sweet potato fries for 45-60 minutes at 350. Everyone should like those. You can add herbs if you want. Mashed sweet potatoes are good with a pat of butter. Sweet potatoes, greens (kale, collards, or chard), and cowpeas are regulars on the table through the winter. They might make their first appearance as separate dishes. Then you could layer them to make a “lasagna”, maybe substituting tortillas for the noodles. Throw in some spaghetti sauce and maybe some cheese. I like cowpeas with just some butter and salt, but my husband puts barbecue sauce on them–at least he eats them. We usually top the greens with vinegar. We will be planning on planting some calories this coming year. I wanted to know how you handle planting potatoes using the wide row method? I’m just trying to figure out how I’m going to hill up the potatoes in the row when my permanent rows are 4ft. wide. You can plant the potatoes in two rows down your 4′ bed, which will leave plenty of room to hill them up. Or, you could plant them hexagonally at about 12″ between each spud and add mulch, such as leaves. The mulch takes the place of hilling. If I plant in a hexagonal pattern how many potato slips would I need for 4′ X 48′ row? You’ll have to figure that out yourself. I generally plant them 12 inches apart. You have to decide if the first row across the 4′ bed is four plants, do you want the next row to be a bit crowded with 4 plants or just put three, and so on. You can work it out on graph paper with everything equidistant. I talk about his in my garden plan DVD. We don’t have a basement, cellar, or root cellar. Do you have any recommendations for saving the potatoes? I figure we’ll be eating regular potatoes for the summer, and then sweet potatoes for the winter, so they wouldn’t have to last for a whole year necessarily. For our canned goods I typically put them in crates and slide them under the kids beds, the beds are the farthermost point from the wood stove.